Tomorrow’s Business Leaders is Recruiting Volunteers for the Spring 2014 Academic Year! • Each program per semester is about 10-14 weeks long. You will teach every other week (5-7 lessons in total) for an hour in the morning prior to working hours or during lunch time. For more information, please see visit the website: http://www.tomorrowsbusinessleaders.org/volunteer. If you have any questions, please contact recruiting@tomorrowsbusinessleaders.org. *Online form says 2012-13; please disregard and complete based on your 2014 schedule. There are several organizations that will pay off a portion of or your entire student loan, or allow you to postpone payments of the loan! Not only can you get a reduction in the amount of your student loans and debts due, but these organizations will also provide you a much valuable life experience. You will gain work experience and knowledge that will help you develop your resume and improve your future career opportunities. VISTA (Volunteers in Service to America). This organization is all about ending poverty, community development, ending homelessness, and increasing literacy in the United States. It will pay off up to $5,000 of your student loans if you join their cause for at least 1,700 hours. 800-942-2677. Peace Corps. By joining together and traveling with the Peace Corps organization, you will get to defer most of your student loan bills until after you leave the program. Not only will you get them deferred, but you may even be able to get some of your student loans reduced by as much as 70%. Dial 855.855.1961 to find a local office. Americorps. If you volunteer for Americorps for a year, you will be rewarded with up to a $5,000 reduction in your student loans and also a stipend of up to $7,400. (202) 606-5000. Teaching. If you sign up to teach full-time under certain conditions and meet all conditions of the program, your student loan will be completely forgiven. Some of these options include : 1) Teach in an area designated as a teacher-shortage area. 2) teach special education classes, or 3) teach in a school facility that educates students from lower income families. Social Services. If you are a full-time provider of early intervention services for the disabled, a full-time nurse or medical technician, an employee of an organization that provides assistance and services to families of lower income communities, or a full-time corrections or law enforcement officer, your student loan can be completely absolved. Restrictions (such as those that involve the date your loan was made) may apply. Law school loan forgiveness. If you have just graduated from law school, you likely owe a significant amount of money. Many law students owe between $80,000 and $125,000 in student loans and have an outrageously high monthly bill. Over 30 law schools in the U.S. will allow for student loan forgiveness to students who take on-profit positions or public interest positions, whether part time or full time. Visit Equal Justice Works for a list of these schools and more information, or dial the main office at (202) 466-3686. Become a docent – also known as an exhibit interpreter – at the New York Aquarium and help staff exhibits, teach visitors about marine conservation, and assist at events and education programs! As a docent, you will have the opportunity to meet individuals from around the world and join a family of fellow volunteers, staff, and wildlife experts who share a passion for our natural world. The Docent Program is open to anyone age 15 and older: high school students, college/grad students, and adults. Significant support for this program is provided by National Grid. To get involved, print and fill out an application. You must be at least 15 years or older to apply. Admission to the program is competitive. After an interview and orientation, accepted candidates must complete an intensive 7-day training course (see training schedule below). Applications are being accepted now for the summer, academic year, and year-long docent opportunities. The training includes sessions on marine science, public speaking skills, and activities designed to foster good relations among docents. Applicants under age 18 must have a parent sign their application form and a teacher fill out the recommendation form. Open to high school students, ages 15–18. Participants must volunteer two full days (6½ hours/day) per week at minimum, in order to complete a total of 120 service hours and 5 education hours. Days are flexible. Open to high school students, ages 15–18. Participants must volunteer once every other week during volunteer shifts in the mornings (9:30 a.m.–1:30 p.m.), afternoons (1:00–5:00 p.m., weekends only), or full days (9:30 a.m.–5:00 p.m.), totaling 150 service hours and 5 education hours. Open to those out of high school, aged 18 years and older. Participants must volunteer either once a week during volunteer shifts in the mornings (9:30 a.m.–1:30 p.m.) or afternoons (1:00–5:00 p.m., weekends only), OR full days (9:30 a.m.–5:00 p.m.) once every other week, for 1 year, in addition to completing 5 education hours. Download the teacher recommendation form. If you have any questions, please call the volunteer office at (718) 265-3450, Saturday through Thursday, between 9:30 a.m. and 4:30 p.m. or email nyadocent@wcs.org. 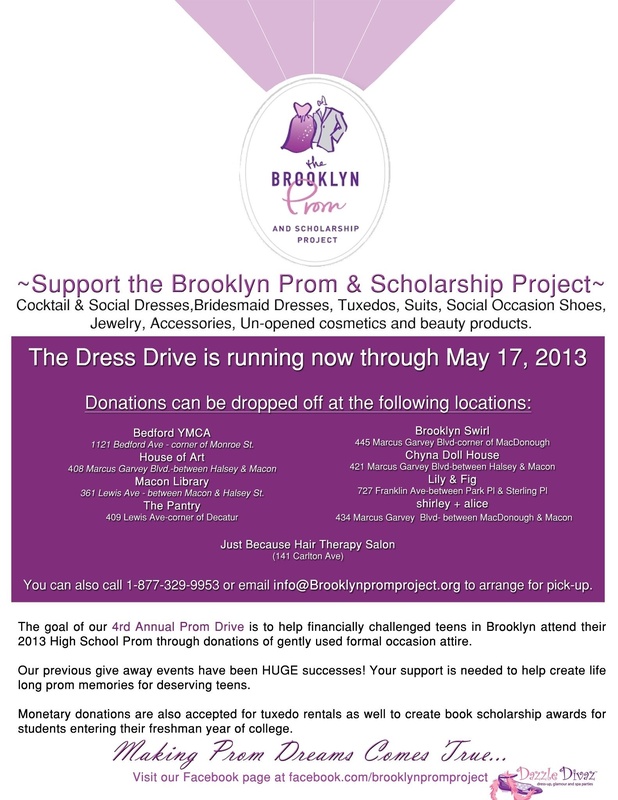 Support the 4th Annual Prom Drive to help financially challenged teens in Brooklyn attend their 2013 High School Prom through donations of gently used formal occasion attire. Cocktail and social dresses, bridesmaid dresses, tuxedos, suits, social occasion shoes, jewelry, accessories, unopened cosmetics and beauty products are welcome now until May 17th, 2013! 1121 Bedford Ave. – corner of Monroe St.
361 Lewis Ave. – between Macon & Halsey St.
For more information call 1-877-329-9953 or email info@brooklynpromproject.org to arrange for pick-up. On April 21, 2013, the 9/11 Memorial will host a 5K Run/Walk and Family Day to raise awareness about the National September 11 Memorial & Museum and to encourage volunteerism. The 5K is 3.1 miles. All funds raised through your participation in the 9/11 Memorial Run/Walk and Family Day will support the 9/11 Memorial and 9/11 Memorial Museum. The Run/Walk and Family Day will take place in lower Manhattan, taking participants on a historic route passing important places that are part of the 9/11 story. The route will also symbolize how we came together to support one another in the aftermath of 9/11. The date of the Run/Walk and Family Day – April 21 – marks the anniversary President Barack Obama signed into law legislation making 9/11 a day of service and volunteerism in the memory of the victims of the 2001 attacks. Please register by April 2, 2013 for discounted early registration fees. Many have been affected by 9/11, including Blanca Garcia, sister of Helen Garcia who lost her life on 9/11. Visit http://grouprev.com/inmemoryofhelen to participate in her team walk and/or donate to the cause.